The Saronic Gulf covers an area whose boundaries are marked by three distinct points: the Corinth Canal in the northwest, Cape Sounion in the east and the island of Hydra in the south. The Saronic Gulf islands are Salamina, Aegina, Angistri, Poros, Hydra, Dokos and the Methana peninsula. The southern coast of the Saronic Gulf is mostly surrounded by 900 metre high mountain ranges. 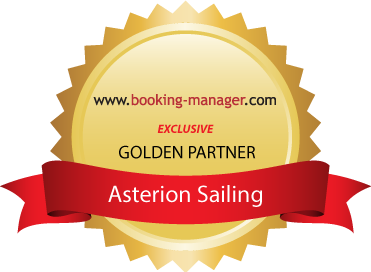 For a cruise in the Saronic Gulf, you will need around a week. But if you want to explore the Argolic Gulf and the coast of Peloponnese, you should allow for 2 weeks. The sailing area is well marked, and most destinations are well visible on departure. Beware of traffic, especially ferries entering en leaving the ports -they cause considerable swell. The Saronic Gulf you can reach from our satellite base in Athens or, if you have more time, from our main base in Corfu. The summer wind varies depending on the area. Between the Corinth Canal and the Cape Sounion and between the mainland coast and the south coast of Methana, the prevailing wind is the Meltemi which blows from July to October. It blows from north-northeast or north-east up to 4-6 Beaufort. Around the Cape Sounion, the Meltemi can be up to 8 Beaufort with strong gusts. If the Meltemi does not blow, the wind usually comes from the south. In the Argolic Gulf you can mostly leave the Meltemi behind. Down the east coast, the Meltemi comes from the northeast and is much weaker. In spring and autumn, south-eastern winds prevail and are usually mild to moderate. However during that time of the year, it can be stormy, although storms are usually relatively short-lived (one or two hours). Otherwise, both the Saronic and the Argolic Gulf, have a generally sunny climate. These changing conditions make sailing in the Saronic Gulf medium to difficult.